Two instalments ago we learned that, just like a Finder window, a command prompt is ‘in’ a single folder/directory at any time. That folder is known as the current working directory, or the present working directory. 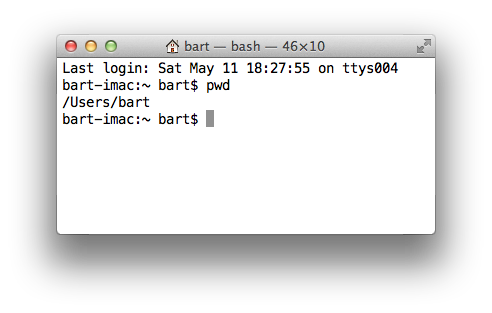 Although the default Bash command prompt on OS X will show us the name of our current folder, it doesn’t show us the full path. To see the full path of the folder you are currently in, you need the pwd (present working directory) command. This is a very simple command that doesn’t need any arguments. Knowing where you are is one thing, the next thing you might want to do is look around to see what’s around you, and for that you’ll need the ls (list) command. If you run the command without any arguments you’ll see a listing of all the visible files and folders in the current directory. On OS X, this default view is annoying in two ways. Firstly, you’ll see your files and folders spread out over multiple columns, so scanning for a file name alphabetically becomes annoyingly confusing, especially if the list scrolls. Secondly, on OS X (though not on most Linux distros), you won’t be able to tell what is a file and what is a folder at a glance, you’ll just see names, which is really dumb (even DOS does a better job by default!). You can force ls to display the contents of a folder in a single column in two ways. You can either use the -l flag to request a long-form listing, showing lots of metadata along with each file name, or, you can use the -1 flag to specify that you just want the names, but in a single column. For now, most of the metadata shown in the long-form listing is just confusing garbage, so you are probably better off using -1. If you do want to use the long form listing, I suggest adding the -h flag to convert the file size column to human-readable file sizes like 100K, 5M, and 64G. I’ve trained myself to always use ls -lh and never to use just ls -l.
You have two options for making it easy to distinguish files from folders in the output from ls on OS X. You can either use the -F flag to append a / to the end of every folder’s name, or, the -G flag to use colour outputs (folders will be in blue). The -F flag will work on Linux and Unix, but the -G flag is a BSD Unix thing and doesn’t work on Linux. Linux users need to use the more logical --color instead. I said that ls shows you all the visible files in your current directory, what if you want to see all the files? Simple, just use the -a flag. Now that we can see where we are with pwd, and look around us with ls, the next obvious step is moving around the filesystem, but, we need to take a small detour before we’re ready to talk about that. In the last instalment we talked about file paths like the imaginary file on Allison’s thumb drive with the path /Volumes/Allison_Pen_Drive/myFolder/myFile.txt. That type of path is called an absolute path, and is one of two types of path you can use as arguments to Linux/Unix commands. Absolute paths (AKA full paths) are like full addresses, or phone numbers starting with the + symbol, they describe the location of a file without reference to anything but the root of the filesystem. They will work no matter what your present working directory is. When you need to be explicit, like say when you’re doing shell scripting, you probably want to use absolute paths, but, they can be tediously long and unwieldy. This is where relative paths come in, relative paths don’t describe where a file or folder is relative to the root of the file system, but, instead, relative to your present working directory. If you are stopped for directions and someone wants to know where the nearest gas station is, you don’t give them the full address, you give them directions relative to where they are at that moment. Similarly, if you want to phone someone in the same street you don’t dial + then the country code then the area code then their number, you just dial the number because, like your command shell is in a current working directory, your telephone is in an area code. With phone numbers you can tell whether something is a relative or an absolute phone number by whether or not it starts with a +. With Unix/Linux paths the magic character is /. Any path that starts with a / will be interpreted as an absolute path by the OS, and conversely, any path that does not begin with a / will be interpreted as a relative path. If you are in your home folder, you can describe the relative path to your iTunes library file as Music/iTunes/iTunes\ Library.xml (note the back-slash to escape the space in the path). That means that your home folder contains a folder called Music, which contains a folder called iTunes, which contains a file called iTunes Library.xml. Describing relative paths to items deeper in to the file system hierarchy from you is easy, but what if you need to go the other way, not to folders contained in your current folder, but instead to the folders that contain your current folder? Have another look at the output of ls -aG1 in any folder. What are the top two entries? I don’t have to know what folder you are in to know the answer, the first entry will be a folder called ., and the second entry will be a folder called ... These are the key to allowing relative paths that go up the chain. The folder . is a hard link to the current folder. If you are in your home folder, ls ./Documents and ls Documents will do the same thing, show you the contents of a folder called Documents in your current folder. This seems pointless, but trust me, it will prove to be important and useful in the future. For now, the more interesting folder is .., which is a hard link to the folder that contains the current folder. I.e. it allows you to specify relative paths that move back towards / from where you are. In OS X, home directories are stored in a folder called /Users. As well as one folder for each user (named for the user), /Users also contains a folder called Shared which is accessible by every user to facilitate easy local file sharing. Regardless of your username, the relative path from your home folder to /Users/Shared is always ../Shared (unless you moved your your home folder to a non-standard location of course). .. means go back one level, then move forward to Shared. You can go back as many levels as you want until you hit / (where .. is hard-linked to itself), e.g. the relative path from your home folder to / is ../../. Finally, the Bash shell (and all other common Unix/Linux shells) provides one other very special type of path, home folders. We have mentioned in passing in previous instalments that ~ means ‘your home directory’. No matter where on the filesystem you are, ~/Music/iTunes/iTunes\ Library.xml is always a relative path to your iTunes library file. But, the ~ character does a little more than that, it can take you to ANY user’s home folder simply by putting their username after the ~. Imagine Allison & Steve share a computer. Allison’s username is allison, and Steve’s is steve. Allison and Steve can each access their own iTunes libraries at ~/Music/iTunes/iTunes\ Library.xml, but, Allison can also access Steve’s at ~steve/Music/iTunes/iTunes\ Library.xml, and likewise, Steve can access Allison’s at ~allison/Music/iTunes/iTunes\ Library.xml (all assuming the file permissions we are ignoring for now are set appropriately of course). So – now that we understand that we can have absolute or relative paths, we are finally ready to start navigating the file system by changing our current directory. The command to do this is cd (change directory). Firstly, if you ever get lost and you want to get straight back to your home directory, just run the cd command with no arguments and it will take you home! Generally though we want to use the cd command to navigate to a particular folder, to do that, simply use either the absolute or relative path to the folder you want to navigate to as the only argument to the cd command, and assuming the path you entered is free of typos, off you’ll go! Finally for this instalment, I just want to mention one other nice trick the cd command has up it’s sleeve, it has a (very short) memory. If you type cd - you will go back to where ever you were before you last used cd. As an example, lets say you spent ages navigating a very complex file system and are now 20 folders deep. You’ve forgotten how you got there, but you’ve finally found that obscure system file you need to edit to make some app do some non-standard thing. Then, you make a boo boo, and you accidentally type just cd on it’s own, all of a sudden, you are back in your home folder. Don’t panic, you won’t have to find that complicated path again, just type cd - and you’ll be right back where you were before your rubber-fingered the cd command! That’s where we’ll leave things for this instalment. We now understand the structure of our file systems and how to navigate around them, next time we’ll dive head-long into these file permissions we’ve been ignoring for the last two instalments. I ran the two ls commands but everything is only in bytes and one in Kbytes. Is this expected? Oh I should mention of the above note, I have my home folder mapped to an internal rotational drive. That shouldn’t make a difference I assume. The command is behaving as expected in your example above – because the folder contains only folders, and not files, the effect is not very obvious. Try repeat your experiment in your Documents folder, or any other location where you have regular files, and you’ll see the difference -h makes much more clearly. Note that Unix/Linux files sizes on folders don’t behave like most people expect. It seems reasonable that the size of a folder would be the total size of the files contained within the folder, but that is not the case. A folder is just a special file, and the size you see is the size on disk of the special file that describes the folder. This is why folders are always TINY – just a few bytes. Further in the series you’ll come across the du command which will allow you to get the size of all files containing within a folder.